Wednesday Secretary of State John Kerry offered a $75 million bribe to Palestinians to pursue Israeli peace talks. Kerry announced the aid during a stop in the West Bank city of Bethlehem. Wednesday’s announcement brings the total U.S. contribution to the Palestinian Authority’s High Impact Micro-Infrastructure Initiative program to $100 million. White House spokesman Jay Carney by contrast said Monday that the “vast majority” of Iranians want better relations with the United States. And U.S. negotiators are pursuing a deal with Iran that could result in some sanctions being lifted in exchange for concessions that may allow Iran to retain some limited enrichment capability. 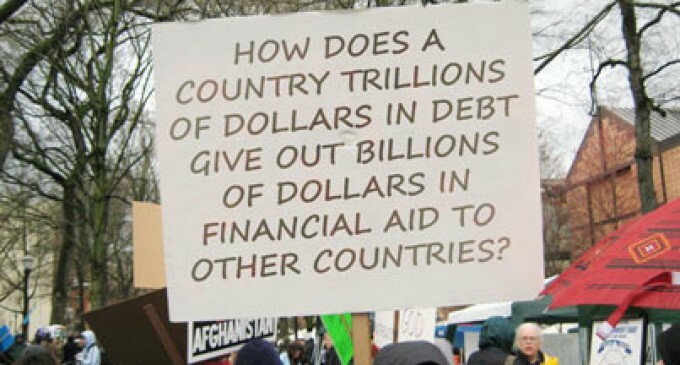 How does a country trillions of dollars in debt give out billions of dollars in financial aid to other countries, especially countries that support terrorists intent on wiping out America? take it out of his pay. It’s not HIS $$$ to play with !!!!!!!!!! I want my share back, all of it, with treble damages PLUS interest. It wasn’t for peace talks, it was to arm for war!!!!! More aid to our enemies, disguised as “money for peace” I call BS. Liberals will never learn that you don’t make the worlds problems go away by simply throwing more and more money at it.